Royal Doulton bone china gravy boat with saucer "Melrose Pattern" H.4955 Light turquoise blue outer surface with gilt embellishment. White inner surface. Jug: 22.5 long (from edge of handle to tip of spout) and 10.5 cm high (from base to maximum point on handle). Saucer: 21 cm by 14 cm. Royal Doulton Fine Bone China. Made in England. Regalia pattern H5130. Decorated with a deep blue band with turquoise and blue detail on a pure white ground. Gilt trim. Elegant and sophisticated set. ROYAL DOULTON OXFORD BLUE CUP AND SAUCER. THE CUP STANDS 3" HIGH AND IS 3 3/8" WIDE, THE SAUCER IS 5 5/8" WIDE. BRIGHT GILDING, CLEAN INSIDE AND OUT. MORE TABLEWARE AND COLLECTABLES AVAILABLE @ CHINAFIND. There appear to be no signs of general wear and tear. Royal Doulton Tableware, RD 2004. Set of Six Royal Doulton bone china soup coupe cups and saucers "Melrose Pattern" H.4955 Light turquoise blue outer surface with gilt embellishment. White inner surface. Soup Cups: 11.2 cm diameter and just over 5 cm high; 180 ml capacity Saucers: 15.2 cm diameter. Designed by Bruce Oldfield (2004). 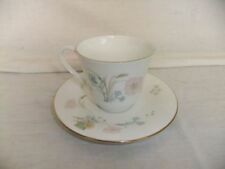 Fine china cup & saucer by Royal Doulton. Mark on base reads DOULTON 2004 RD. Cup height approx 7cm (2.75"). This is a Royal Doulton New Romance Oxford Blue tea cup & saucer. The cup is first quality but the saucer is a second but both are in very good condition. Vintage 1989 Royal Doulton Minerva Trio. Cup Saucer & Tea Plate. Cup Saucer & Tea Plate. Royal Doulton fine bone china. Made in England. Venetia Pattern H5042. Decorated with a border of blue and Green floral garlands Gilt Trim. 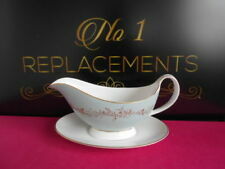 Royal Doulton Cup & Saucer Pale Blue Band with Gilding (set of 4). Condition is New. Dispatched with Royal Mail 2nd Class. Modern piece from 2004. Lorraine's Emporium. ROYAL DOULTON. 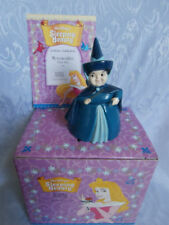 1995 ROYAL DOULTON. OXFORD BLUE. Colour - white with blue band and gold edge detail. Detail, gold edge and colour - detailed, shiny, clear and bright. Image of a lion stood on a crown. 4 Royal Doulton Bone China Saucers. Unwanted gift would make a super addition to any Royal Doulton collection. 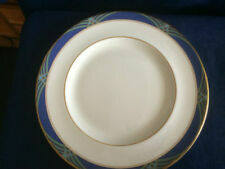 4 pristine china saucers decorated with navy blue and gold on the rim. Pair of Royal Doulton Translucent China 'Forest Glade' Cup & Saucers. Lovely retro 60's duo in blue with grey and white foliage sprigs and cream Interior. Cup size is 6.5cm high and 9.5 across. Capacity is 200ml. 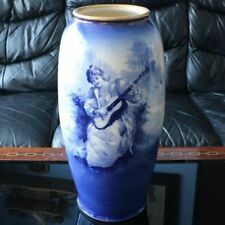 Doulton blue bruce oldfield 2004. ( rest of set got broken when moved). ROYAL DOULTON. Colour - white with blue detail. Detail and colour - detailed and bright. Image of a lion stood on a crown. Royal Doulton fine china. Made in England. Autumns Glory Pattern LS1086. Decorated with Autumn fruits. Ref 12 - 17. 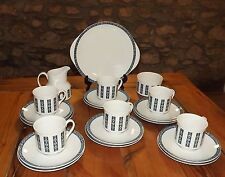 ROYAL DOULTON BRUCE OLDFIELD Cup and Saucer Sets x 4. Design, Gold Gilt and Colour – detailed, clear and bright. Colour - White with blue bands and gold edge detail. Underneath says. Royal Doulton Hampton Court TC1020 Saucer. These where bought and put in storage yet never used. It has a thick band of grey/blue with a gilt rim. And fees make this impossible. Happy to consider. CONISTON PATTERN. ROYAL DOULTON CUP & SAUCER. SAUCER IS 6" ACROSS APPROX. CUP BOWL SHAPED. THIS ITEM IS- ROYAL DOULTON BLUE & GOLD SAUCER.